Mutati faction MMD Youths in Lusaka have reported their ‘former’ party president Nevers Mumba to the police for ‘Impersonation’. Dr Mumba is reported as having presented himself to the media and public as MMD President when he is in fact not. MMD Lusaka Youth Trustee Eddie Shanambe who reported Dr Mumba at Central Police in Lusaka on Friday afternoon said Dr Mumba has continued to use the title of President of the Party when he ceased being party President when the Party elected Felix Mutati at it’s 6th General convention. Mr Shanambe said there are no factions in the MMD and that youths in the party did not want to take the law in their own hands. He said Dr Mumba’s continued masquerades are fanning confusion with members of the public further saying now that they have reported the matter, the Police should do their part. Meanwhile youth Chairperson Ellis Malambo said youths in the party were law abiding and that unlike youths in other political parties who believe in sorting out their differences via violence the MMD youths believed in the competence of the country’s law enforcement agencies. He called on Party structures in the provinces not to be mislead by Dr Mumba as MMD is led by Mr Mutati who was legitimately elected at the convention last May. He also said the party is not in any alliance with UPND as purported by the former Party President who has been going round with UPND claiming that the MMD is working with the opposition. He said any issue to do with an alliance with the UPND was entered into by Nevers Mumba as an individual representing himself and his household and not as the MMD because as a party we did not employ him as an ambassador for an alliance anywhere. Meanwhile, MMD Copperbelt Information and Publicity Secretary Mr. Peter Phiri has advised the public to ignore the youth who were paraded before cameras on ZNBC TV news on the evening of Friday 17th June, 2016, demanding the arrest of Dr. Nevers Mumba. Mr. Phiri explained that the leader of the group, Eddie Shanambe, is a cheap, rentable ‘cadre on hire’ who was rented early last year to hallucinate that Dr. Mumba was no longer MMD President and declared himself interim MMD president. 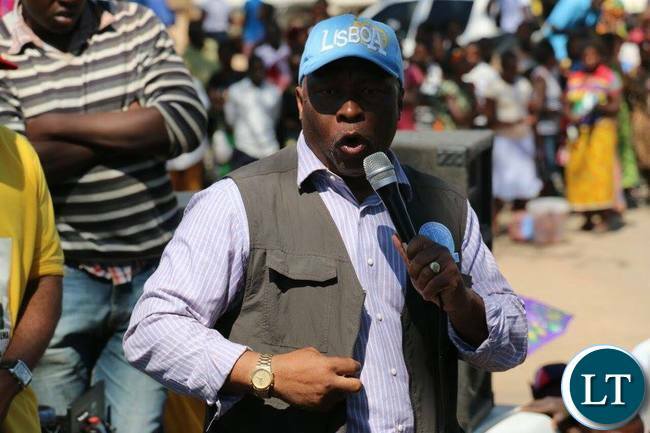 A few weeks later, the same young man took himself to several television stations to publicly apologise to Dr. Mumba and the MMD Leadership for bringing the party into disrespute, declaring that he had been misled. The MMD Copperbelt official has urged ZNBC management to maintain its enduring record as a reliable source of serious, well researched news content and avoid destroying its good image by featuring thugs like Shanambe. He reminded the sponsors of the youth that embracing lawlessness to settle scores is very foreign to genuine MMD members as the party is governed by the rule of law and respect for its constitution. He further said that the MMD has full respect for legal institutions such as the Lusaka High Court which upheld the party’s expulsion of former Lunte MP Felix Mutati who is the one now masquerading as MMD President. As far as the MMD is concerned, Mr. Mutati remains expelled and cannot be President of the MMD which expelled him. Mr. Phiri said Dr. Nevers Mumba is the duly democratically elected MMD President until 2017 when his 5-year term expires. Lusaka times reporters have an interest in MMD. I say so because legally, there is no such thing as MMD faction. A convention was held and has been recognised by law, so that means what the law recognises is the MMD, not a faction as reported. But another group of people decide to call themselves with a similar recognised in law, they become a faction. But following how lusaka time reports on MMD issues, it clear they would rather perpetuate the idea of factions when this matter is settled, well at least legally. But why is Nevers Mumba claiming to be MMD president when he is not?plus out of desperation even hh has allowed Mumba to be lying at their poorly attended rallies that he is mmd president when Felix Mutati is now the true MMD president?PLEASE ZAMBIA POLICE HELP RETORE ORDER IN ZAMBIA! !WHY DO YOU ALWAYS WAIT FOR PEOPLE TO TELL YOU THEN REACT?WHAT KIND OF POLICE DO WE HAVE IN ZAMBIA?PLEASE POLICE ARREST NEVERS MUMBA AND TEACH HIM A LESSON SO THAT HE CAN KNOW THAT WHAT HE IS DOING IS A CRIME!!! Never Mumba one time of the Zambia Shall be Saved fame, now reduced to the level of the UPND fame, somewhere below GBV. From some of the comments coming,it can be said that indeed we’ve some useful *****s for Rupiah the manufacturer of Mutati at the shum Rupiah convention,hence the launch of the Movement for Mutati Demcracy(mmd).Which legality are these useful *****s talking about?.How can an expelled MMD member(non-member) be the president of the same Party(or organisation that expelled him?.To that effect,Mutati has even withdrawn his challenge from the Supreme Court after the High ruled that Mutati was duly expelled.The withdraw of the appeal means the status quo of being expelled then still stands.Infact it should be Mutati who is imperonating himself as president of the Legal Institution of MMD. Well reported,Lusakatimes.You’re being professional in your reporting.After covering the Mutati group,you had at least to hear from the genuine MMD Official who put the record straight.Keep it up Lusakatimes.